We are pleased to announce a series of conversations on this topic in partnership with the IBM Social Business, Exceptional Digital Experience team. 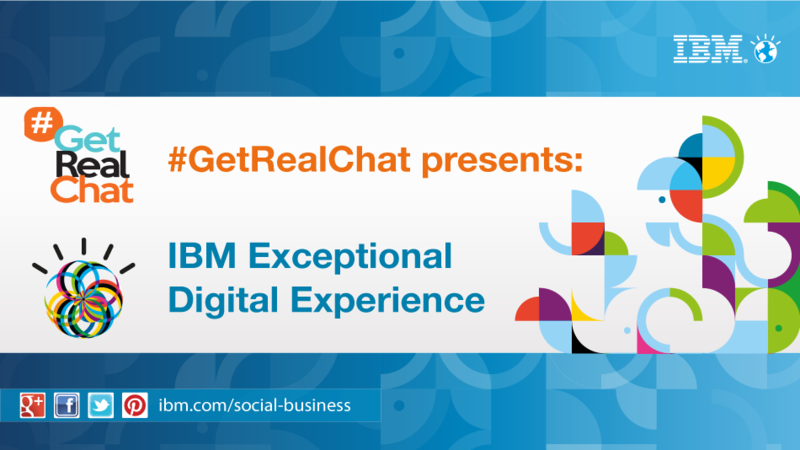 To kickoff the conversation IBM is joining as a special guest on #GetRealChat 7/18/13 at 11 am et. We'll then go even deeper for the launch of our brand new radio show, #GetRealChatRadio the week of July 29th! IBM is also hosting a webcast this Wednesday, and a Facebook chat July 26th! Below you will find more information and details for how you can join the conversation. This is not a one stop chat or webcast for you to receive an exceptional digital experience kit in a box. Instead this is the start of a conversation for us all to explore, learn, optimize and grow together.